Tiny Habits is a new way to create habits in your life. Dr. BJ Fogg is the creator of the Tiny Habits Method. This method is a breakthrough because now you can succeed without relying on willpower or motivation. Join us from anywhere in the world. After you get started, it takes 3 min/day (at your convenience) for 5 days (Mon – Fri). Step by step, we make it easy for you to practice creating habits. Over 65,500 people have reported that Tiny Habits worked for them. They say Dr. BJ Fogg’s method is surprisingly simple and fun. 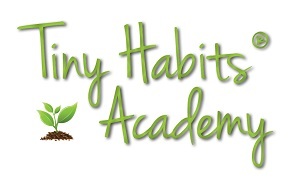 Linda Fogg-Phillips, M.S., Director of the Tiny Habits Academy or one of our Tiny Habits Certified Coaches, will send you daily “Check-In” emails that will have additional information about the Tiny Habits Method and tips about how to create successful Tiny Habit recipes. You will also be invited to our private Tiny Habits Facebook group where you will have access to FB Live Broadcasts and other videos from Linda about Tiny Habits. Some of our Tiny Habits Certified Coaches are in the Facebook group to answer the questions that you post in the Facebook group and to give you personal guidance on your Tiny Habits journey. The results for people using this system have been really good.